â ULTRA SOFT FABRIC. Our flannel duvet cover is made of 45mm high pile microfiber shaggy fleece reverse to ultra soft crystal velvet mink. It also can be used as a bedspread or blanket when taking out the insert in the warm months. â SIZE AND PACKAGE. 4-piece king set comes with 1Duvet Cover 87 by 95 inches. 1 Bedskirt 79 by 87 inches. 2 Pillow Cases 20 by 30 inches. NO COMFORTER INCLUDED. â NO COMFORTER INCLUDES. 4pc set includes 1 Duvet Cover,1 Bedskirt, 2 Pillowcases. No comforter insides. Our photo on the website is included the comforter to show the looking when you put your insert into the duvet cover. â LUXURY SOLID DESIGN. 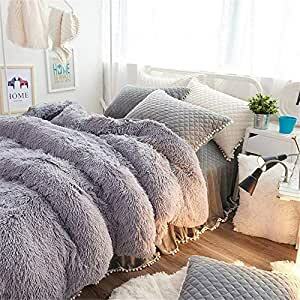 The flannel bedding set features a luxury fluffy mongolian faux fur to create a plush, cozy space, reverse to a solid crystal velvet fabric. It is perfect to cuddle under during chilly days and nights. Give you warm sleeping. â RETURN POLICY GUARANTEE. If you are not satisfied with EVDAY flannel bedding set, just return it within 30 days for a full refund. We provide 24-hour customer service support, 30-day full refund back guarantee, 2-year quality warranty.